An old fishing boat has been hauled out onto the shores at Battle Harbour in Southern Labrador allowing visitors to the island to see what fishermen once used. Visitors to Battle Harbour, located at the entrance to St. Lewis Inlet in Southern Labrador, Canada, can view many historic items such as this old fishing boat laid to rest along the shore. Battle Harbour was once home to a salt fishery in the early 1770's, eventually leading to being the major base for cod and seal fisheries and for the commercial trade. A decline in inshore fishery took place at the beginning of the 1990's with a majority of the residents leaving the island. After many years, Battle Harbour has been reconstructed, restoring the structures, walkways and work areas and is now open to the public. An old fishing boat hauled out on the shore at Battle Harbour, Battle Island at the entrance to the St Lewis Inlet, Viking Trail, Trails to the Vikings, Southern Labrador, Labrador, Atlantic Canada, Canada. 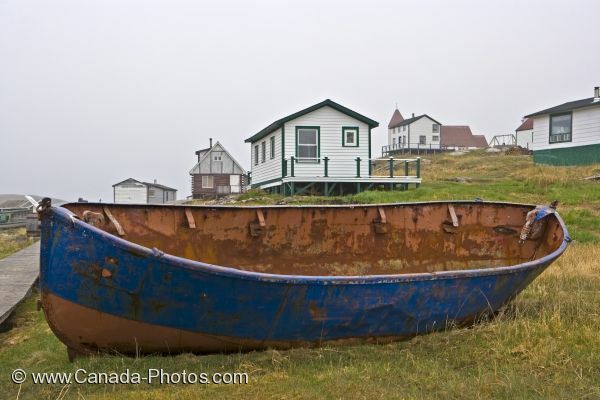 Picture of an old fishing boat at Battle Harbour in Southern Labrador backdropped by restored buildings.